To the average layperson, “radioactivity” is a harsh and scary word. But the fact is that radioisotopes, both natural and artificial, are all around us. And for marine scientists in particular, they are important tools. Oceanographer Claudia Benitez-Nelson reviewed some of the fundamentals at the start of the November 2012 Fukushima and the Ocean conference in Tokyo. That radiation comes in two broad types. The non-ionizing type, which includes visible light and microwaves, lacks enough oomph to create charged ions, and thereby to alter the structure of an atom. It poses little threat to our health. Ionizing radiation, however, can actually change the atomic structure of living tissue—killing cells or making them cancerous. That’s why we try to avoid direct exposure to medical X-rays and the sun’s ultraviolet rays. All radioisotopes—also called radionuclides—lose excess energy by emitting ionizing particles such as neutrons, protons, electrons, or photons. In the process, these so-called parent radioisotopes transform, or decay, into daughter isotopes containing different numbers of protons and neutrons. Daughters with the same number of protons are isotopes of the parent element; daughters with a different number of protons are actually different elements, with different chemical properties. Each change along the way, Benitez-Nelson noted, follows a unique timetable, or half-life. 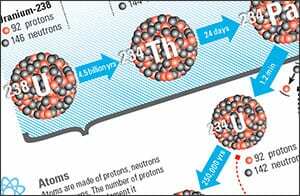 The half-life of an isotope is the time it takes for one-half of the atoms in a given sample to decay. This daughter isotope can decay into another radioisotope, or the daughter isotope, that will continue the radioactive decay chain or into a stable element that ends the chain. For example, one of the most common naturally occurring radioisotopes, uranium-238, has 92 protons and 146 neutrons. It decays into thorium-234 (90 protons, 144 neutrons), which decays into protactinium-234 (91 protons, 143 neutrons), and so on. The half-lives for each of these radioisotopes, respectively, are 4.468 billion years, 24 days, and 1.17 minutes—and each of these elements chemically reacts in a different manner. “Because that half-life differs from one radioisotope to the next, we can use it as a simple clock to study a host of ocean processes that take place across different timescales, from days to years to millennia,” Benitez-Nelson said. So-called radioactive “tracers”—some present in the ocean for eons, some formed by the interaction of incoming cosmic rays from space with atmospheric gases, and still others introduced by human activities—can help scientists unravel how fast ocean waters mix, how quickly groundwater from land enters the ocean, and how rapidly carbon and other elements are cycled through air, sea, seafloor, and continents. Several common naturally occurring radioisotopes—uranium, thorium, and potassium—are always present in seawater. In fact, noted Benitez-Nelson, the amounts of these isotopes present in the ocean are thousands of times higher than those of even the largest human sources of radioactivity.